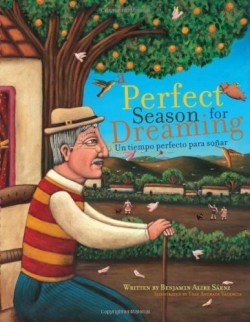 With the arrival of summer, seventy-eight-year-old Octavio Rivera “had a feeling that he was about to have the most fantastic dreams of his life.” Each afternoon his dreams are indeed incredible, as a guitar, kissing turtles, winged pigs, coyotes dressed in mariachi outfits, and other outland-ish objects fall from a giant piñata. At first Octavio tells no one, but as his dreams become more vivid, he yearns to share them with someone he trusts. He doesn’t dare tell his son or daughter-in-law, who will only think he is crazy; nor his younger brother Marcos, who will only think such dreams are for children; nor his best friend Joe, who will only tell him to avoid eating too many gorditas and chorizo. The man finally realizes that there is only one person who loves dreams as much as he does—his six-year-old granddaughter, Regina. Octavio’s bilingual story is accompanied by surreal, full-page illustrations, reminiscent of Mexican folk art. Influenced by Diego Rivera and Rufino Tamayo, plants, animals, and people fly and float through the sky in the bold acrylic paintings, while Octavio blends into his surroundings, his head becoming part of a hilltop or his body carried on the back of a hummingbird. A self-proclaimed “fronterizo,” a person on the border, author Benjamin Alire Saenez was born, and today lives, on the United States-Mexico border. The American Book Award-winner is a poet, essayist, and author for adults, young adults, and children. His other picture books include A Gift from Papa Diego and Grandma Fina and Her Wonderful Umbrellas. Illustrator and professional artist Esau Andrade Valencia was born into a family of artists in Mexico, and has exhibited throughout North America. The traditional artwork is a fitting complement to Saenz’ folktale-like prose. Just like Regina, young readers will marvel at the beauty, richness, and unpredictable qualities of Octavio’s dreams. Readers of all ages will appreciate the sincere affection between grandfather and grandchild in this intergenerational story. A perfect book for sharing aloud.